As a steadfast fan, during the summer hiatus sometimes it is fun to look back and find out different things about the show to pass the time. We all know that he had what looked like fatal stab while getting his daughter to the wardrobe to our world. However, the writers thought that it might be too hard to continue the show without him, so instead his character ended up in the hospital in a coma for a time before hearing his story told to him appeared to make him wake up. However, they never heard back from her management team. Probably a good thing, though, it would have taken quite a bit of time out of her busy schedule. The Blue Fairy has appeared quite a bit. 3. Rumplestiltskin/Gold remembered who he was only after Emma told him her name. Being the one to have given The Evil Queen the curse, it only makes sense that he would be able to get a loophole out of it to remember who he was. Being omniscient, he would know bits and pieces of what was to lie ahead but not entire details (for example what happened to his son) it is why he was so insistent on getting her name from Snow, and why he wrote it obsessively in his cell so that he wouldn't forget it. It was his key to breaking the curse on him. 4. Hook was originally meant to come in during season one. However, there were copyright issues. He eventually made his way onto the show during season two, first appearing in The Crocodile episode. He didn't make the cut, but he eventually came back and made an appearance as Prince Eric. While Ginnifer, her mother, is only a year older than her and four years older than him. In J.M. Barrie's original draft for the play, Peter Pan was actually a villain, who would kill the Lost Boys when they got too old... Actually that makes Felix's end that much more poignant. And for those who think it's impossible for him to have been who he ended up being, in the story Neverland is a place where you go in your dreams and anything you imagine or want can come to be. Keeping that in mind it all makes sense. Captain Hook was added later and made the villain. 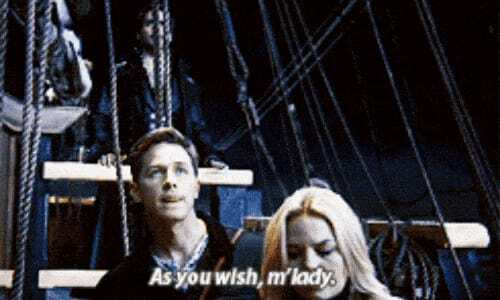 This is made most evident in the fact that he left and came back to help at the end of season 2 (ala Han Solo) and his manner as well as his saying "As you wish" to Emma, as Westley did to Buttercup. And any true Princess Bride fan knows exactly what those words really mean. A fetching shade of green. The creators had worked with Rebecca on Lost, and worked her into the character. Ariel and her story appeared when The Little Mermaid was rereleased, Cruella appeared when 101 Dalmatians was rereleased, the Wicked Witch appeared on the anniversary of The Wizard of Oz and a year after the release of Oz The Great and Powerful. It does make sense with them being owned by ABC which is a part of the Disney Company.